The Fairfax County Park Authority is taking part in the National Park Service’s (NPS) Preservation 50 celebration to mark the 50th anniversary of the nation’s protection of America’s historic places by posting a series of blogs about county historic places on park land. The National Register of Historic Places, a part of NPS, was established in 1966. This series is based on information that appears in each site’s nomination to the National Register. The nomination forms give us a chance to look back and learn why the sites were considered to be significant historic places. They were masters of landscape design and architectural style, and Green Spring Gardens is the only known time that they collaborated. That is one of the highlights explaining the significance of Green Spring Gardens in its 2003 nomination for the National Register of Historic Places. The nomination form states, “Beatrix Farrand is recognized as a pioneer of American landscape design,” and she was the only female among the founders of the American Society of Landscape Architects. Her work includes Dumbarton Oaks in Georgetown, Princeton University, Vassar, the University of Chicago and Oberlin College. She was a niece of author Edith Wharton. Green Spring was one of the last commissions of her life and her only garden in Virginia. Walter Macomber was a 20th century architect who was involved with the restoration of Colonial Williamsburg and who spent 30 years as the resident architect of Mount Vernon. Noted for his skills with Colonial Revival, he also was the architect for the State Department Reception Rooms in Washington, and he renovated and redesigned old houses for private owners. One of the houses he renovated was the brick house at Green Spring. The house is, by itself, significant because it is one of the few rural homes in Fairfax County that remains from the late 18th century. Although renovated in 1942 in Colonial Revival style, the exterior still has chimney, brickwork and other architectural characteristics of the Colonial period. The land at Green Spring first appears in historic records of 1706. Some of the owners into the 1800s served in Fairfax County’s government, and the land was farmed for tobacco, wheat and corn. Orchards and dairy farms appeared in the early 1800s, and a map from 1861 shows four taverns on the property along Little River Turnpike. In 1878, the land was purchased by a member of Mosby’s Raiders in Civil War days, Fountain Beattie, who converted the third floor garret level into bedrooms with dormer windows. The land passed through several other owners in subsequent years including, fortunately, Minnie Whitesell. Archival photos show that the house was in poor shape when she bought the property in 1931 and, against advice to demolish the house, she renovated it and subdivided the property. Michael and Belinda Straight bought the house along with 33 acres in 1942 and commissioned the work by Farrand and Macomber. Michael Straight was the editor and publisher of The New Republic and the deputy chairman of the National Endowment for the Arts. Belinda Straight was a child psychologist. The Green Spring nomination says, “The Straights entertained guests of national and international importance,” including authors Aldous Huxley and Saul Bellow, poet Dylan Thomas, Supreme Court Justice Hugo Black, and one-time vice president Hubert Humphrey. Change, as always, was coming. By 2000, many historic sites had tossed aside the Colonial Revival style and replaced it with historically accurate architecture and design. Private homes displaying the style were routinely redesigned, and much of the area around Green Spring was significantly altered. Green Spring Gardens is located at 4603 Green Spring Road in Alexandria. More information about the park is on the Green Spring Gardens website. As part of Preservation 50, visitors to the Fairfax County Government Center at 12000 Government Center Parkway in Fairfax can see an exhibit case in the building’s lobby. 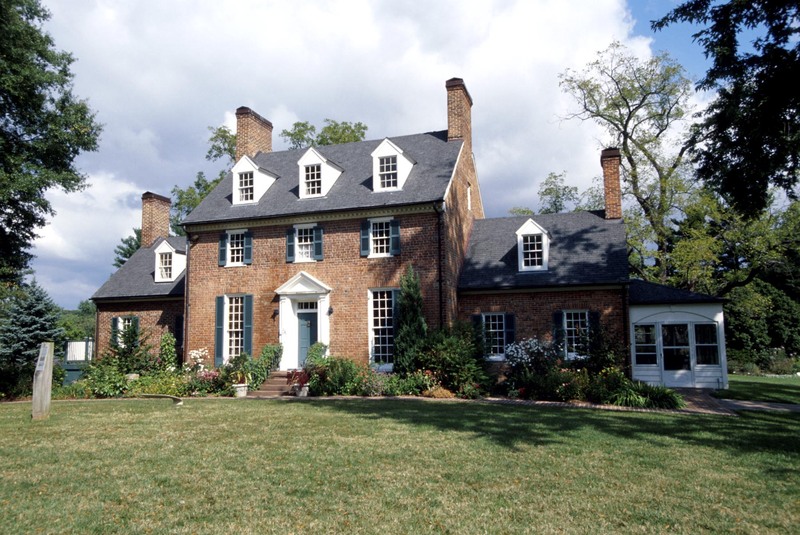 The exhibit, a partnership of the Fairfax County Park Authority and the Fairfax County Department of Planning and Zoning (DPZ), showcases some of the 59 county properties and districts that are listed in the National Register of Historic Places. The Park Authority and DPZ host two symposia this year on the impact of the National Historic Preservation Act on Fairfax County. The first, “Setting the Stage for Local Preservation,” will bring together historic preservation professionals who have played roles in the National Historic Preservation Act on a federal and/or state level. It will be held on April 16, 2016, at the James Lee Center, 2855 Annandale Road in Falls Church, Va. The second symposium will explore grassroots results of how the Act has affected local historic preservation. The date and place of that fall symposium are not yet confirmed. This entry was posted in Uncategorized on May 22, 2016 by Fairfax County Park Authority.